Statutory basis for citation of prior art patents or printed publications in patent files and ex parte reexamination of patents became available on July 1, 1981, as a result of new sections 301-307 of title 35, United States Code, which were added by Public Law 96-517, enacted on December 12, 1980. The rules of practice in patent cases relating to reexamination were initially promulgated on April 30, 1981, at 46 FR 24179-24180 and on May 29, 1981, at 46 FR 29176-29187. The reexamination statute was amended on November 2, 2002, by Public Law 107-273, 116 Stat. 1758, 1899-1906 (2002) to expand the scope of what qualifies for a substantial new question of patentability upon which an ex parte reexamination may be based (see MPEP § 2242, subsection II.A), and made technical corrections to the statute. See the 21st Century Department of Justice Appropriations Authorization Act, TITLE III- INTELLECTUAL PROPERTY, Subtitle A - Patent and Trademark Office, Section 13105, of the "Patent and Trademark Office Authorization Act of 2002" - Enacted as part of Public Law 107-273 on November 2, 2002. On September 16, 2012, the Leahy-Smith America Invents Act (the AIA), Public Law 112-29, 125 Stat. 284, was enacted. 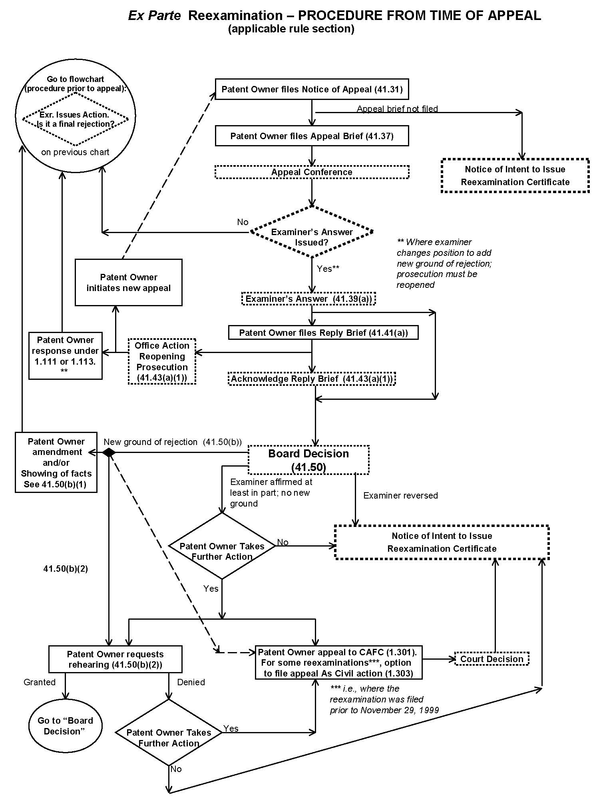 The AIA expanded the scope of information that any party may cite in a patent file to include written statements of a patent owner filed in a proceeding before a federal court or the United States Patent and Trademark Office (Office) regarding the scope of any claim of the patent, and provides for how such information may be considered in ex parte reexamination, inter partes review, and post grant review. The AIA also provided for an estoppel that may attach with respect to the filing of an ex parte reexamination request subsequent to a final written decision in an inter partes review or post grant review proceeding. The AIA also provided for a first-inventor-to-file prior art regime to replace the first-to-invent prior art regime, with respect to prior art available to be applied to claims. The prior art regime under which the application for the patent was examined (the first-inventor-to-file prior art regime, or the first-to-invent prior art regime) will generally be applied in the reexamination of the patent. However, there are rare exceptions. For example, a situation may arise in which a benefit claim to an application filed before March 16, 2013, is added in a reexamination proceeding based on an AIA patent. If all of the claims that have ever been presented in the reexamination proceeding and the underlying patent are fully supported by the prior application filed before March 16, 2013, and the application which resulted in the patent subject to the reexamination proceeding did not claim, directly or indirectly, the benefit of an application filed in the United States that presented at any time a claim that had an effective filing date on or after March 16, 2013, then the reexamination proceeding would be examined under the pre-AIA, first to invent, provisions. This chapter is intended to primarily be a guide for U.S. Patent and Trademark Office (Office) personnel on the processing of prior art citations and ex parte reexamination requests under 35 U.S.C. 302, as well as handling ex parte reexamination proceedings. Second, it serves as a guide to the formal requirements for filing such documents in the Office. It is noted that all citations in this chapter to 35 U.S.C. discussing the first-to-invent prior art regime (as opposed to the first-inventor-to-file prior art regime) are to the relevant statute in effect prior to March 16, 2013. Ex Parte Reexamination Proceedings Resulting from Supplemental Examination Proceedings: Section 12 of the AIA added new 35 U.S.C. 257, which provides for a proceeding titled "supplemental examination" that may be requested by the patent owner to consider, reconsider, or correct information believed to be relevant to the patent in accordance with requirements which have been established by the Office. The information that may be presented in a request for supplemental examination is not limited to patents and printed publications, and may include, for example, issues of patentability under 35 U.S.C. 101 and 35 U.S.C. 112. If the supplemental examination certificate, which is issued under 35 U.S.C. 257(a), states that a substantial new question of patentability is raised by one or more items of information in the request, ex parte reexamination of the patent will be ordered under 35 U.S.C. 257. See MPEP Chapter 2800 for guidance on the procedures for supplemental examination proceedings, and for procedures regarding the order and first Office action mailed in any ex parte reexamination proceeding ordered as a result of a supplemental examination proceeding. Inter Partes Reexamination Proceedings: On November 29, 1999, the American Inventors Protection Act of 1999 (the AIPA), Public Law 106-113 was enacted, and expanded reexamination by providing an "inter partes" option. The AIPA authorized the extension of reexamination proceedings via an optional inter partes reexamination procedure in addition to ex parte reexamination. 35 U.S.C. 311 - 318 (in effect for inter partes reexaminations filed prior to September 16, 2012) are directed to the optional inter partes reexamination procedures. The final rules to implement the optional inter partes reexamination were published in the Federal Register on December 7, 2000 at 65 FR 76756 and in the Official Gazette on January 2, 2001 at 1242 OG 12. Effective September 16, 2012, section 6(c) of the Leahy-Smith America Invents Act (the AIA), Public Law 112-29, 125 Stat. 284, replaced the inter partes reexamination process that was established by the AIPA with an inter partes review process, such that (on or after September 16, 2012) the Office no longer entertains requests for inter partes reexamination but instead accepts petitions to conduct inter partes review before the Board, where appropriate. For any inter partes reexamination filed prior to September 16, 2012, the provisions of 35 U.S.C. 311 - 318 as they were in effect prior to September 16, 2012, continue to apply to the inter partes reexamination proceedings. See MPEP Chapter 2600 for guidance on the procedures for inter partes reexamination proceedings, as well as with respect to an ex parte reexamination proceeding merged (consolidated) with an inter partes reexamination proceeding. 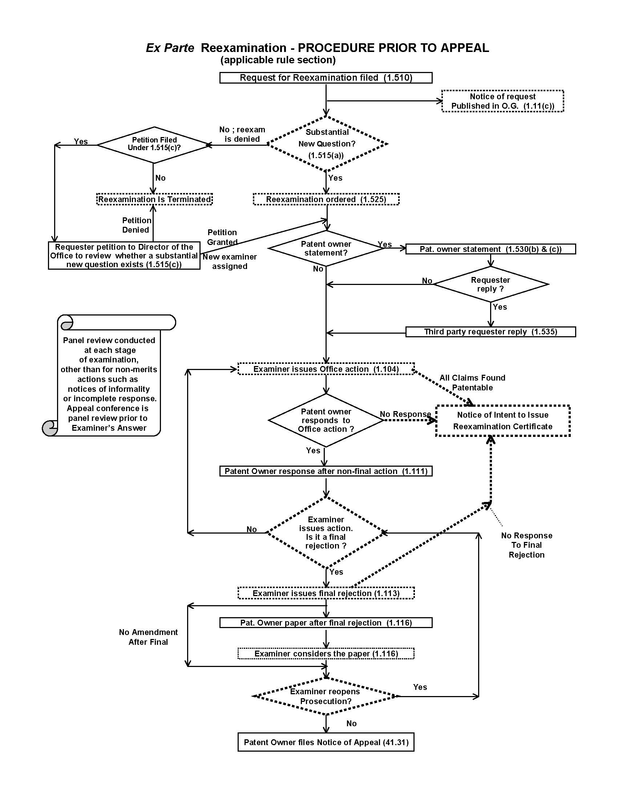 Flowcharts: The flowcharts show the general provisions of both the citation of prior art and ex parte reexamination proceedings, including reference to the pertinent rule sections.